you go along or always stick to a pre-made plan? Non-fiction is planned so tightly about all that’s needed after outlining is to put things into coherent sentences and add punctuation. Fiction? I do loosely plot but the characters write the story. I know the beginning and end, but they generally change things to suit themselves, so how I get from “Once Upon a Time” to “The End” can be a surprise. 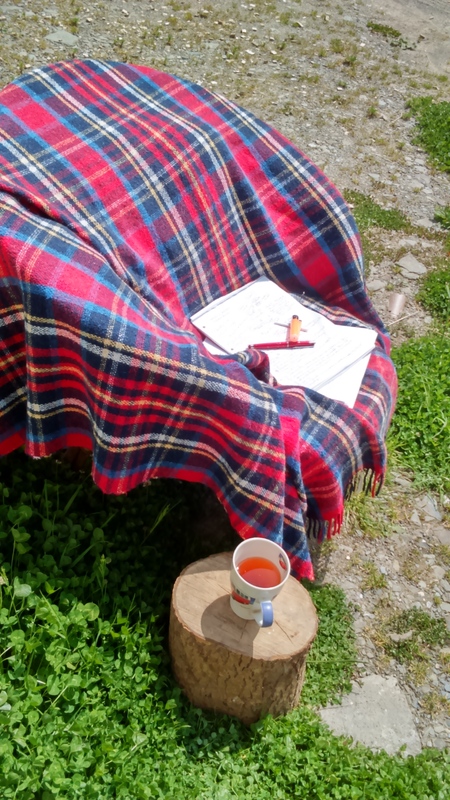 2 Do you have a writing ritual? Meditation, certain cup for your tea, writing trousers? I too find it tricky switching gears these days…. 3 Aside from writing, what makes you tick? Tell us 5 things about yourself we probably don’t know. Apart from the fact I don’t like to talk about myself? I’ve been dancing since Mom taught me to waltz when I was a toddler standing on the tops of her feet. I love to dance and was, during the disco era, a professional dancer, as well as a disc jockey in a nightclub. (No, that’s not how I got my nickname. That came earlier.) I’ve even been a member of a clogging troupe. Strangely, for a dancer, I don’t listen to music very often. I get caught up in the music and can’t concentrate on work; or start dancing around and forget to do whatever chore I’m supposed to be doing. Even classical music makes me lose track of time. I’m a homebody who’s waiting for someone to invent and perfect transporter technology. I love to visit far-flung family and friends, and see new and different places, but prefer my own bed to anywhere else. I usually want to make a U-turn almost as soon as we leave the house to go to the airport. I’m a huge baseball fan. That takes precedence over virtually anything else on the telly during the season. But I don’t actually watch It’s on in the background while I’m reading or doing other things. I’ll look up when the announcers get excited about something; or check the score at chapter’s (or chore’s) end. Apart from having sports on in the background, I don’t watch much television at all. Therefore, I’m horribly out of the loop when friends discuss the latest television series…or even movies. I loved dancing on my Dad’s feet, always makes me smile when I think of it. Lovely insights, thank you. If you count people and cats as things, then my husband, the cats, a fully-loaded e-reader, coffee (one of the four major food groups) and a pot to make it in, and dark chocolate (also one of the four major food groups). I don’t need much if I have those and the basic necessities. 5 On said island, what 5 books would you take and why? For an avid reader, that’s a really tough question! A plant identification book specific to the island. Which ones can I use for what, and which should I avoid? Robinson Crusoe by Daniel Defoe, to make myself feel better about being stranded. Any of Nigel Tranter’s fiction. He wove Scottish history into fascinating stories. One of the Harry Dresden Files, if you won’t let me take the entire series. Jim Butcher tells a good tale and makes me laugh. One of the Iron Druid Chronicles (or the entire series…). Kevin Hearne is just as good as Butcher. Living or dead? If dead, Barbara Jordan. She was my heroine growing up. (I’ve never minded a well-behaved ghost.) If living, Sir Patrick Stewart. (Not just because of his Star Trek connection, but there is that.) His life has taken some interesting turns and I think it would be fun to talk about them. His public persona is intriguing and, like all public people, I’m curious as to whether the private person is the same. 7 Your current writing projects? I’m working on Fudge’s story. Fudge is the familiar to the protagonist in The Ogre’s Assistant series. He’s over 2,000 years old so it’s magic woven in with history. Or is that history woven in with magic? While I thought I was finished at the end of Transformation!, another Ogre’s Assistant book is floating around in the back of my head. I’ll probably get around to plotting that out in the next couple of months when I need a break from Fudge. 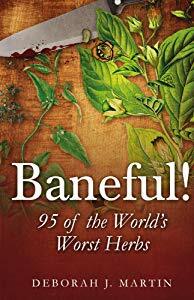 Also perking in the background is a book about herb usage throughout history – both magical and medicinal. The research is pretty much done but I can’t figure out how to make it interesting to anyone but me. Perhaps someday the proverbial bulb will light, and that book will get written. If not, I learned a thing or two. 8 Other published work and links…. Thank you so much for joining me DJ. Lovely to discover more about you and your books. 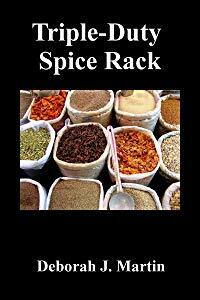 Check out Deborah’s books via her author pages and her website. My first published novel, Destiny of Angels, was the novel I wanted to read, but couldn’t find. 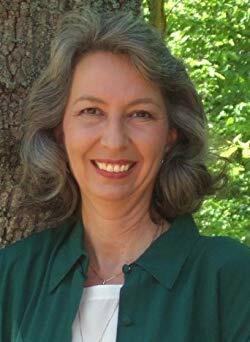 With a large cast of varied characters, Angel Parsons led me along the paths of the witches Qabbalah, and I learned about myself and my writing. 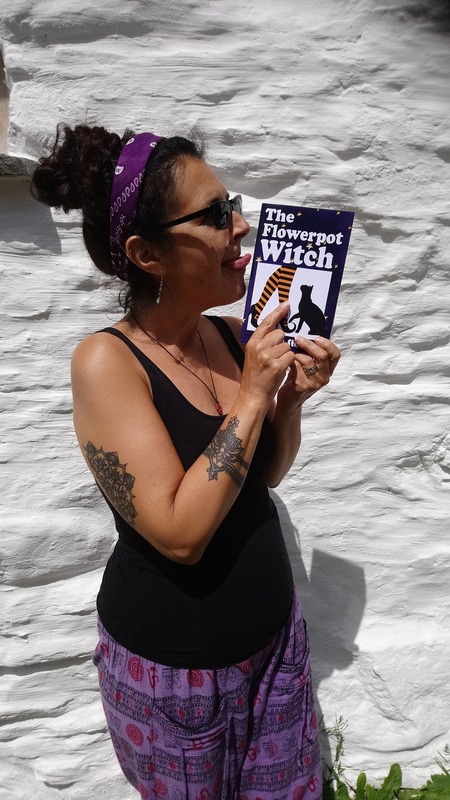 At the time I published, magical realism was stuffed full of vampires and werewolves, so it was time for real people and real magic, but without realising it, I’d written a specialist book. Not every reader cared about the opportunity to view life through different eyes, and be open to the idea of alternative realities. 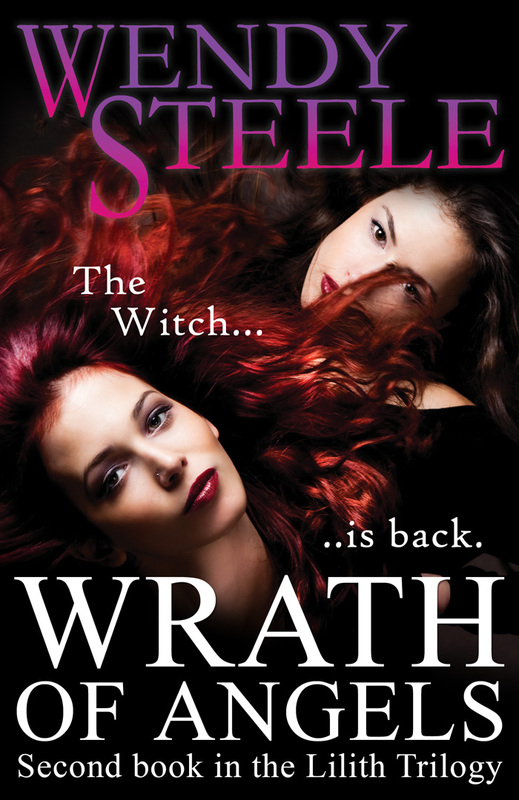 I wrote the sequel Wrath of Angels because it needed to be written (and it’s a far superior novel to Destiny in my opinion), but I had no readers and needed to think again. Though ideas for the final book were rattling around in my head, they were quoshed by new ones, evoked by the Welsh landscape. Discovering a Bronze Age settlement site on the hill beside our house, my mind was drawn to the past and the people who lived there, and to those who will live there in the future and the Standing Stone book series was born. 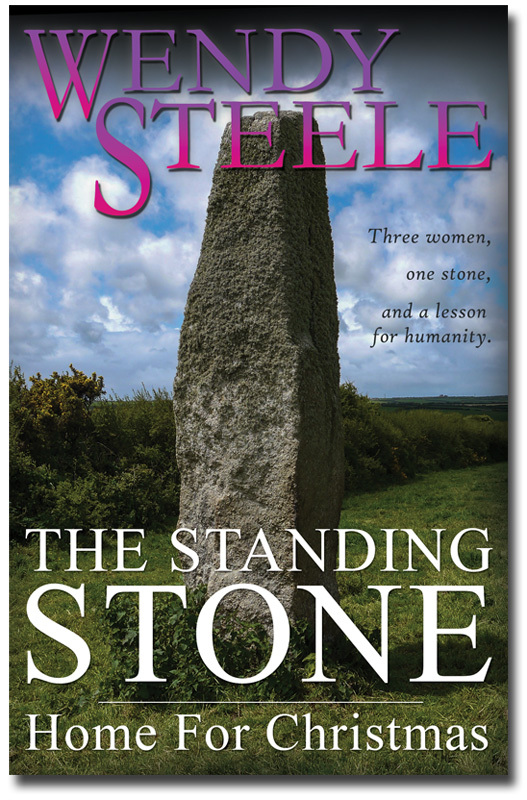 Three women linked, across time and space, are brought together in the presence of the goddess by the standing stone and given help and support to deal with their current problems and heartaches. I loved writing these books! 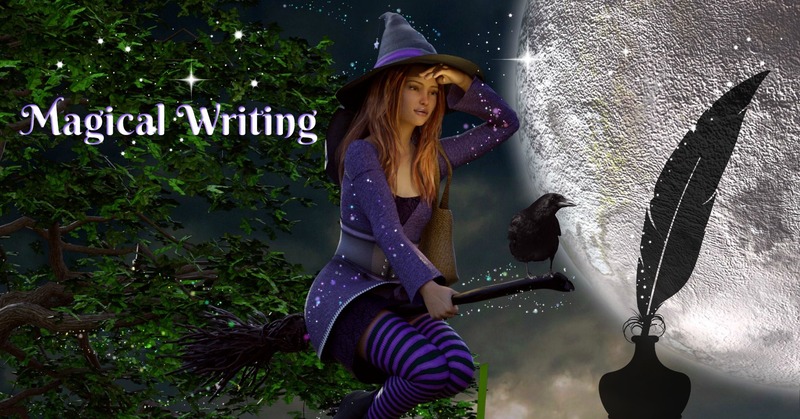 Witch Lit is Magical Writing! 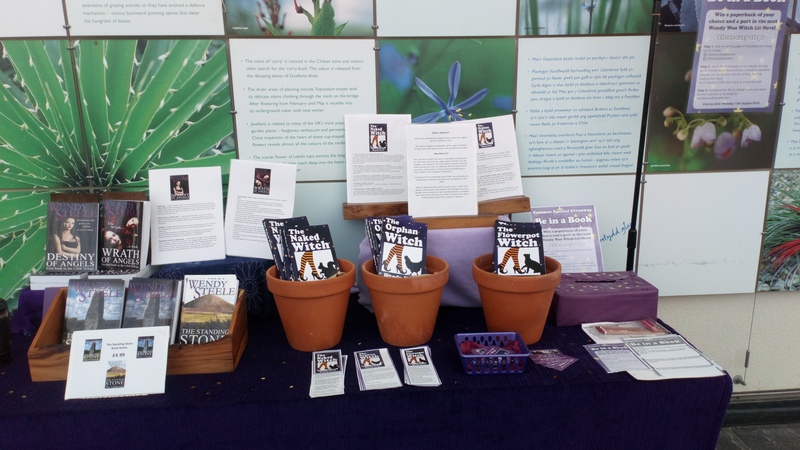 I had a lovely day at the National Botanic Garden of Wales on Saturday at their storytelling event, Plant & Plots, talking to the public about the inspirational, magical landscape of Wales, writing and Witch Lit. Some people are confused when they see the word ‘witch’. In their minds, witch = demons/devils/black magic/sorcery/Satan/baby killers, not necessarily in that order. While many are interested in the idea of living in harmony with nature, giving back and celebrating the beauty and bounty of the planet and taking time to be present and appreciate all that life has to offer, some cannot see beyond the above list. Saturday was no exception; I stood and took the spitting abuse and personal remarks, as well as the advice that I should ‘look to my Bible’. Brought up in a Christian household, I went to Sunday School and church and became a Sunday School teacher. I’ve always loved the stories of Jesus, full of kindness, compassion and common sense. As a pagan and a witch, I have no problem appreciating Jesus as a prophet before his time, in the same way Buddha was. I’ve read many books by the Dalai Lama and the inspirational Amma, Mata Amritanandamayi, has my vote as one of the most important and influential women of this time. As a witch, I follow no organised religion, only a path of love, kindness and compassion towards the planet and all those who live on her. That’s what I want to inspire with my books. 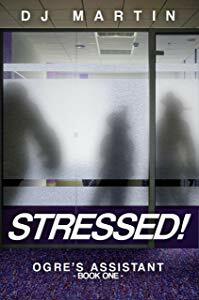 The Lizzie Martin series is funny, the stories are compelling and Lizzie uses magic in her every day life to help her with the stresses many of us face. She is a strong woman. She likes men, but doesn’t need a man to define her. Witch Lit is magical writing of every kind; prose, poetry and song. Join the #witchlitrevolution and bring a little magic into every day of your life. Summer Special Giveaway! Be in a Book! 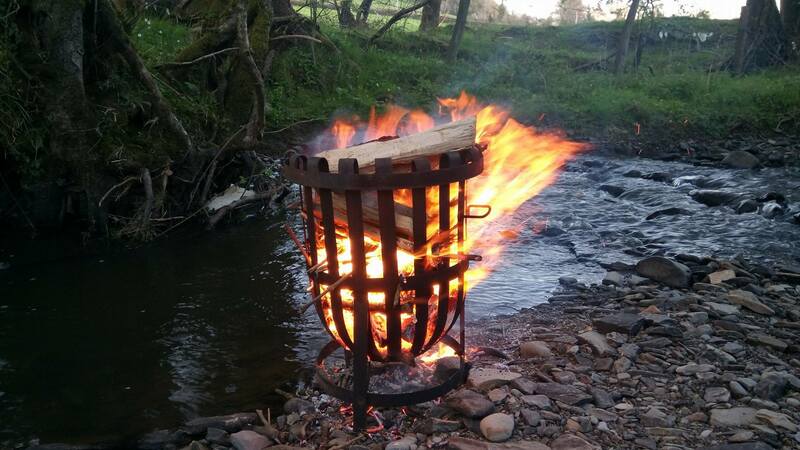 I’m running a new event from today until Monday 13th August. It’s FREE to take part and the prizes are awesome! Summer Special Giveaway is open worldwide. The winner will be announced on Wednesday 15th August. 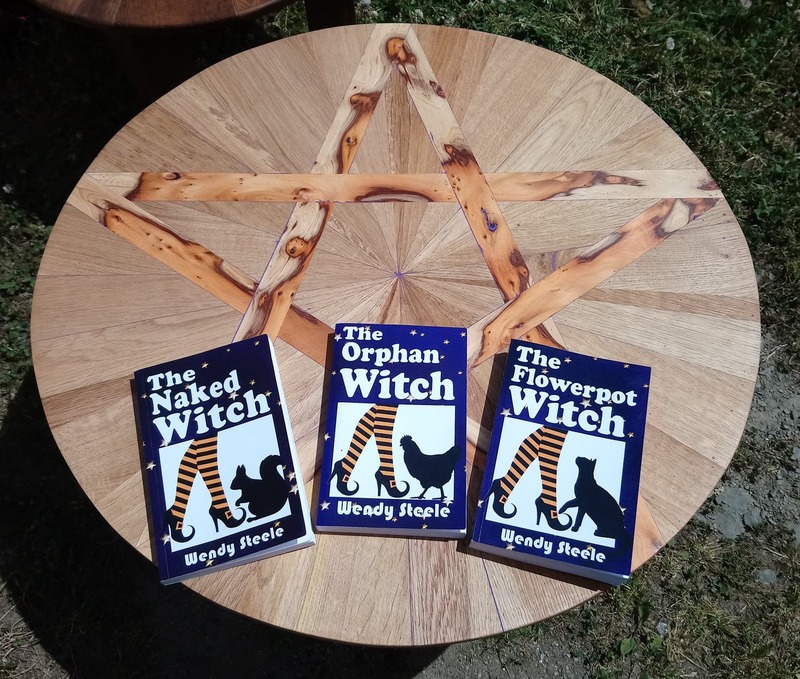 Join the Witchlit revolution and Be in a Book! I’ve not read it or been told, I just know; witches don’t share the details of their magical workings. 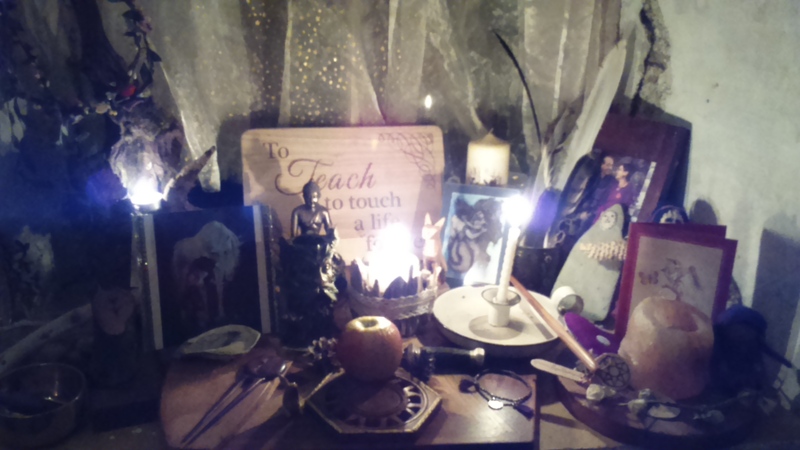 You’ll read books of spells, books of correspondences, practices and rituals you can create for yourself, and manuals and guides for you to create your own magic, but the magic of an evening beneath the moon is for the witch alone. Her personal feelings, gains and knowledge gleaned are for her benefit, for her to mull over and learn from, as it should be. Except for Lizzie Martin. 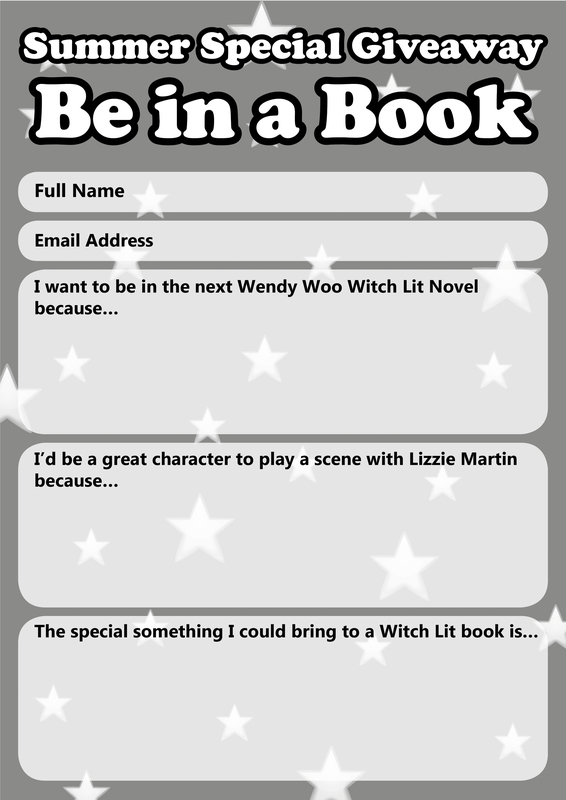 In the Wendy Woo Witch Lit Series, Lizzie Martin shares it all, just like the characters in Dion Fortune’s fiction. It was through Dion Fortune’s books, especially Moon Magic and The Sea Priestess, that I felt compelled to write stories of my own about real people and the magic they create in their lives. Inside her Sanctuary, safe in her circle, Lizzie made a bed in her lap with her cloak for the chicken. The bird trotted around, mimicking a cat following its tail. Cooing contentedly, she nestled down. Two white candles burned on the altar, casting an eerie flickering light, quickly guzzled by the fog of frankincense. The mist swirled, set in motion by splutters from the candles. 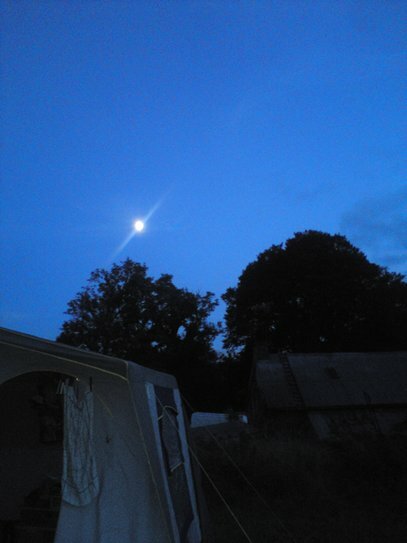 Wrapped in sheepskin, Lizzie sat on the hillside, watching the moon bathing the land in shadow. Sheep huddled among the giant boulders. 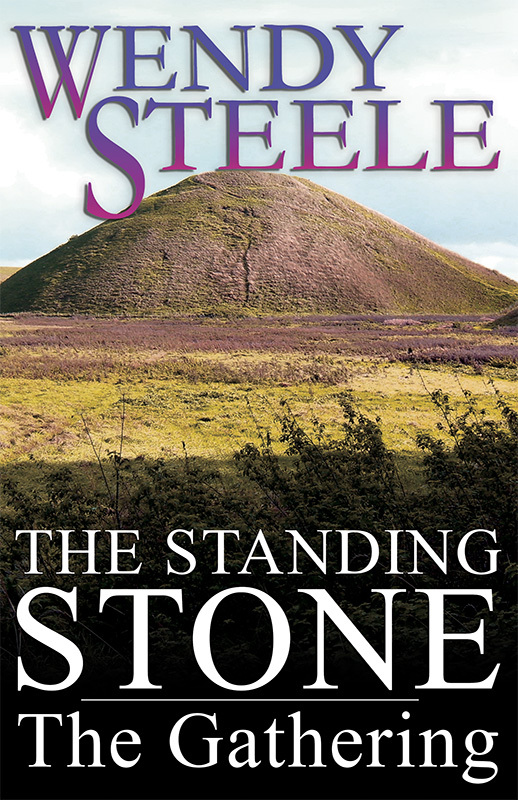 Men and women stood around the standing stone on the hilltop behind her. Darkness was coming. It was time to return to the valley. She climbed to the peak, the crackling of the fire welcoming her before its blessed warmth. Tonight they would keep the dark away, for one night at least. The comforting aroma of ancient books stirred Lizzie and she looked down to the tome open before her. The ticking of her heart sped up. The pages turned in a blur, glimpses of the past bleeding through. Marsha waved from a luxury yacht as did her Granddad, recognisable by the watch chain he always wore in photos. Faces flickered, the pages speeding up, sucking Lizzie into the past with them until she sat wrapped in skins again, looking up into a beautiful, dark brown face framed by oiled and braided plaits. The word ‘mother’ burst within her and Lizzie knew. On the night we remember and revere our ancestors Lizzie was not alone. This was her mother; the mother of us all. Backpack bouncing, Lizzie set off across the uneven grass. She grimaced over the stile, her ribs screaming at her, across endless streams and springs gushing from the earth, onto the track around the lake. Large stones and rocks littered her way. She stopped often, enjoying the fresh wind on her face and the glints of sunlight bouncing off the water. Diverting from the track, the land was rutted and boggy. Her thighs ached and her ribs burned, climbing over the grassy mounds and ridges before dropping down towards the lake. There was little flat ground, but she was sheltered from behind, the only wind blowing off the lake in front of her. She trapped the flapping, white altar cloth with her goddess statue from her Sanctuary. She’d never get the candle in the Goddess’ arms to stay alight, but she’d planned ahead and brought two glass jars and two chunky candles, one white and one orange, already charged with chamomile, myrrh and cinnamon which she placed on the cloth along with a handful of white ribbons, a cloth bag, a jar of milk and an old but serviceable horseshoe. Standing on the tiny beach, the cold wind tugged at her hair and the cloth bag in her hand. She grounded herself, and then cast protection around her before kneeling at the altar. A warm stillness hung over her circle of protection. Lizzie lit the white candle. She lit the orange one. Lizzie knelt before the pregnant maid, mesmerised by the candle circlet adorning her tendril curls. Swathed in a cloak the colour of new leaves, her arms wrapped protectively round her belly, the goddess looked into Lizzie’s eyes. Wisdom, compassion and understanding connected the women and Lizzie found the courage to speak. With your blessing, we look to the Spring. From the cloth bag she withdrew multiple stones, offering each to Brigid to be blessed. To heal with love and compassion. Bringing light into the hearts of those who need it. And the promise of life to come. She picked up the horseshoe. May that house be a happy home. At her altar, around each stone and the horseshoe, she tied a white ribbon before picking up the jar of milk and stepping back onto the beach, in front of the goddess. Opening her arms to the wind, she breathed in the beauty of Brigid and sent up her prayer. Showering us all with your enchanted, empowering light. To ensure new births and new beginnings. She unscrewed the lid and dripped the milk onto the stones and in the lake. And to understand the truth when it is shown to me. 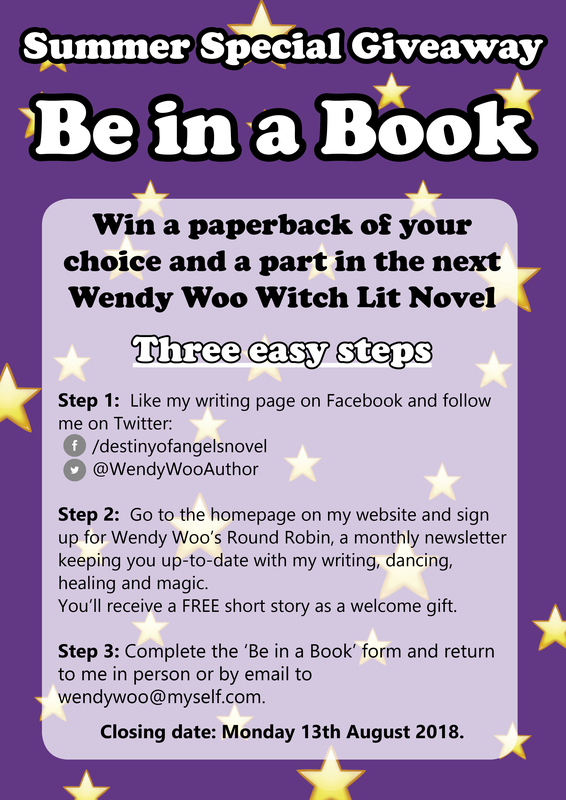 Begin your magical journey with Lizzie Martin and The Wendy Woo Witch Lit Series. And in this case, it is one particular story that matters. It’s a story I’m sharing with you all because it marks a defining moment in my writing. This story is the culmination of eight years of writing and publishing novels. I began writing about high magic and the Wheel of the Year in the two books published so far in the Lilith Trilogy, Destiny of Angels and Wrath of Angels. 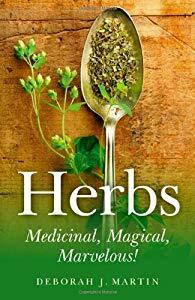 In both books, Angel Parsons travels the paths of the witches Qabalah and celebrates the Sabbats with her friends. I had read all of Dion Fortune’s books and wanted more. 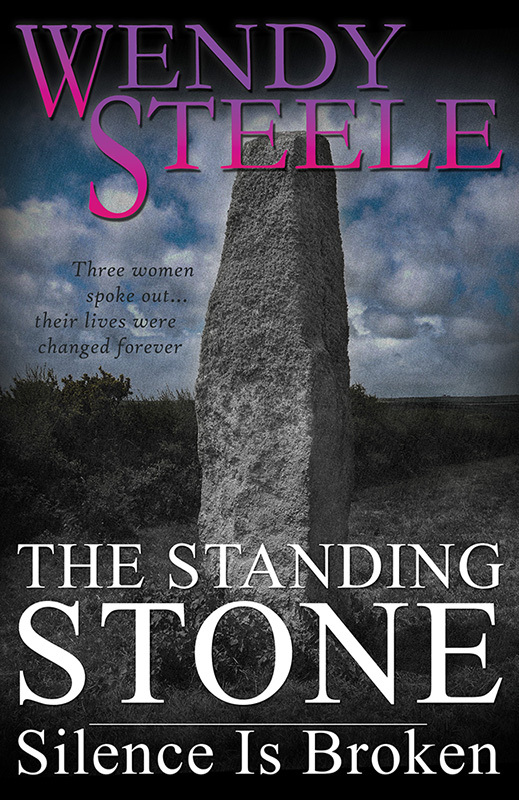 The Standing Stone book series picks up the threads of the Sabbats of the previous novels, setting the lives of the three women lead characters to be directly affected and influenced by the changing seasons on the Wheel of the Year. 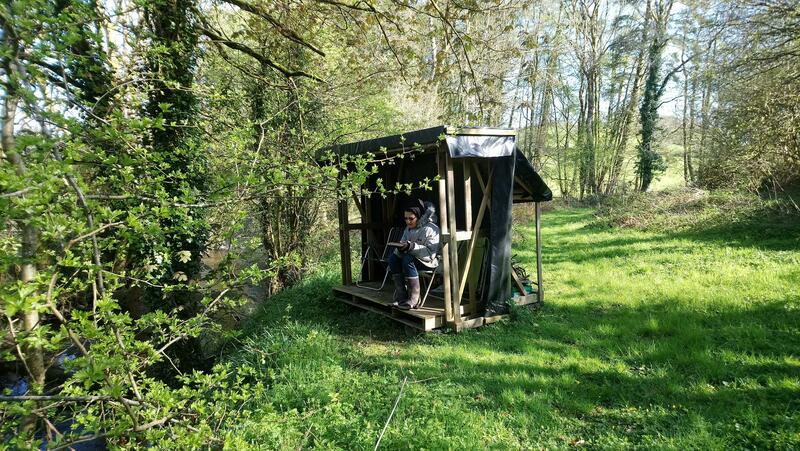 These books were inspired by my own arrival in Wales and the luxury of owning land, including a riverbank and the luxuriousness and diversity of the Welsh landscape. 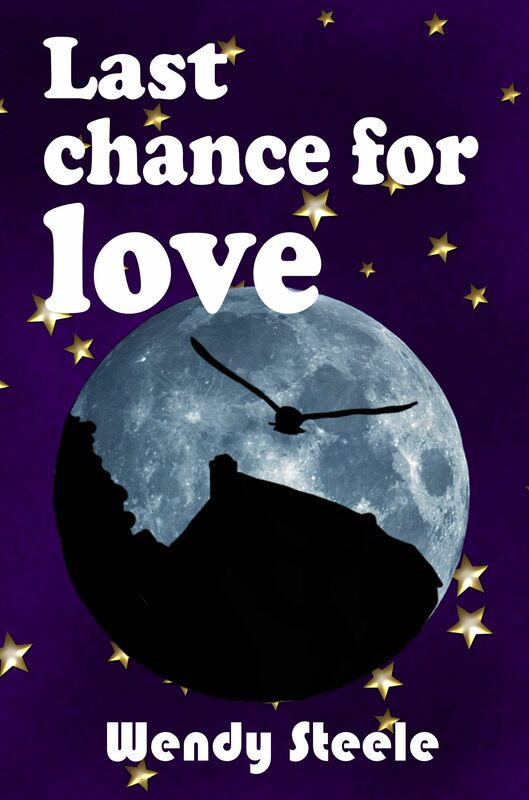 ‘Last chance for love’ is Sally’s story, a modern witch using magic in her daily life but mixing it up, using whatever assistance feels right to her to aid her in her last hope. 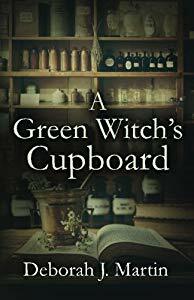 Reading it now, I find it a little ‘clunky’ compared to the Wendy Woo Witch Lit Novels, The Lizzie Martin Series, but this story was the stepping stone to the WitchLit I write now. This story matters. This story led me to an opportunity to share with every reader the ways that they can be empowered to bring a little magic to their own lives in whatever way they like. WitchLit is easy to read but eloquent. WitchLit tells a good, simple story, and then you begin to peel away the layers to reveal its complexity. Sign up for my newsletter today and receive your copy of ‘Last chance for love’.